In the current air of divisiveness and disconnection, it can feel more challenging each day to bring people together in meaningful ways. When I listen to the news on my commute to work each day, the negativity and misunderstandings can seem overwhelming when compared to the small changes and connections I might make possible through my own work in a museum. As we celebrate communities, cultures, histories, memories, and stories in our museums, others deride them and shape a narrative that negates their value here in our society. Yet at this time when we are surrounded by an increasingly fragmented society of ‘us versus them,’ I continue to firmly believe that museums have the potential to be powerful catalysts for empathy and human connection. As museums respond to issues affecting our communities, both locally and globally, there is a clear shift toward focusing on human connection and the role museums play as catalysts for empathy and cohesion in a society rife with intolerance, discrimination, inequality, social isolation, and self-segregation. Embracing a human-centered mindset in museums asks us to advance these concepts of empathy and connection as integral elements to our museums’ values and culture. And it is time to take these principles seriously, and recognize the essential need for museums to lead and take action rather than just follow and passively react. While there are many definitions of empathy out there (and we certainly throw the word around quite a bit these days, present company included), I really appreciated how this concept was framed by educator Thom Markham in a January 2018 article for KQED’s Mind/Shift about empathy and learning in our connected world. I would whole-heartedly agree that we need to move beyond narrowly defining empathy as ‘I like others’ or ‘walking in someone else’s shoes.’ A more complex definition of empathy considers it as a “deep interpersonal skill necessary for effective teaming, customer design, and other aspects of life that require openness to the flow of information.” It involves collectively working toward the common good and making a positive difference in the world. I’m interested in how we can expand our definitions of empathy to consider its relationship with social justice, so that striving for a culture of empathy means that we’re also committing to actions and convictions that lead to more equitable and just communities. These core social functions of museums have been clearly emerging as museum leaders and professionals reflect on how institutions can be relevant and sustainable now and in the future. The Alliance of American Museums 2017 TrendsWatch highlighted empathy and social justice as key forces of change in the field. In a chapter devoted to empathy, Elizabeth Merritt states that “museums’ inherent strengths position them to be effective ‘empathy engines’ helping people to understand the ‘other’ and reinforcing social bonds” (8). To embrace these values, museums are working to build experiences based in storytelling, lived experience, memory, healing, and civic engagement. Exhibitions are being designed in partnership with community members, content is being co-created between museum staff and visitors, and marginalized voices are being brought into the core of museum spaces. How can we more fully integrate these values in our own museum practice and institutional culture? How can those of us working in, for, and with museums begin to make this shift happen toward a more human-centered mindset? In addition to rethinking hierarchies and internal structures, another key starting place for this type of change is simply practicing more empathy within the workplace environment and culture of a museum institution. While this sounds very broad, it can start with anyone at any level of an organization. In many museums, especially large ones, the proliferation of departments and reporting structures combined with an over-reliance on email communication can lead to silos and barriers among staff within the organization. People are not connecting with other people in meaningful ways. I can speak from my own personal experience, having been in plenty of tense meetings in which everyone comes in with their defenses up, ready to battle. A curator is certain that the education staff are going to ‘dumb down’ their ideas. An educator assumes that their suggestions to make an exhibition more accessible to families will be belittled by an exhibition designer. Situations like these are happening in museums everyday, and they are creating and maintaining barriers to change. We’re making assumptions about other people’s values and positions without ever listening to their perspectives. To counteract this, we can begin to form a culture of empathy through the basic building blocks of conversation and listening. Building empathy on an individual level means identifying those people in your organization or in your community about which you might be making assumptions, then spending time having face-to-face conversations with them, taking a step back to truly listen, and trying to gain a greater sense of what they value and why. Being a human-centered museum starts with the human connections and social relationships we build within the institution and among our community. Getting this process started can be as easy as having coffee with co-workers that you find yourself rarely interacting with or even butting heads with. Removing these smaller-scale disconnections is a powerful way to start working toward change in your institution, one conversation at a time. Using a rubric called the Maturity Model, museum staff and leaders can assess their own institution’s commitment to building empathy across a series of characteristics such as civic vision, institutional body language, community resonance, and sustainability. For museums just beginning to think about their work as human-centered, models such as this can provide a spark for meaningful conversations among staff about what it means to be empathetic and better reflect the values of your community. For museums at more advanced stages of this change process, this model can help structure goal setting and inform strategic planning. Photo from John Love’s interactive space “Bound in Yes,” part of the exhibition “Without Sanctuary: Lynching Photography in America” at the Levine Museum of the New South. This project is discussed in Elif Gokcigdem’s edited volume “Fostering Empathy Through Museums” (2017). So this all sounds great, but what if just a few passionate staff are advocating for these ideas and models within an institution? How can these human-centered values of empathy and human connection be integrated into the DNA of an organization, and not just fade if those few passionate staff get frustrated or even leave? Beyond advancing individual empathy as described above (an important strategy toward spreading empathy within an organization), one key strategy is developing core values and a values statement that reflect these ideas. If your museum does not have any type of core value statement, there is never a bad time to get one drafted. Traditionally, this type of institutional language has been created through a top-down process and likely doesn’t have the buy-in of most staff and volunteers. Rather, it’s best to go through a process that allows staff at all levels (perhaps even some volunteers and community members) a chance to express their thoughts about a museum’s core values. These conversations might start during hallway conversations or cross-departmental meetings, and trickle up to the leadership team. The goal here is to develop a simple, clear, open, and transparent set of values that can guide everyday decisions and help organizations answer difficult questions and challenges when they arise. If an organization’s overall culture does not seem ready for this (yet), a similar process can occur within a single department and then often spread from there. Having established a set of values based in human connection can more effectively lead to institutions becoming more human-centered and making decisions that reflect these values. Are you working to embrace empathy in your organization? How do you define empathy in your practice? What challenges do you face in this work, or in thinking about empathy in museum practice? This conversation deserves to be more complex, and bring in as many perspectives as possible. Add your voice to the comments below or via social media (@murawski27), and share your experiences or questions as part of this effort to make change happen in museums. Check out the previous post on rethinking hierarchies, and stay tuned for further posts in this series about how museums might become more human-centered institutions working toward positive impact in our communities, including reflecting on personal agency. Header Image: “Wall of Empathy (6)” photo by David Goehring, not changed, CC BY 2.0. Photo depicts a “wall” of sticky notes installed by an artist group in selected San Francisco BART stations following the 2016 presidential election. This project was inspired by a similar one in the New York subway. As common sense and straightforward as it sounds to think about museums as people- and human-centered institutions—a concept you’ve heard me write about quite a bit—this idea has faced a legacy of rather fierce opposition grounded in outdated traditions and histories. How many museums have mission statements that prioritize the colonizing actions of “collecting” and “preserving” objects, rather than fore-fronting the people-centered work of building community, growing empathy and understanding, celebrating human creativity, and cultivating engaged citizenship? How often do museum leaders and boards make decisions that value objects and collections over staff, volunteers, and museum visitors? What if museum leaders and professionals considered human relationships and human impact, first and foremost, when making decisions about exhibitions, interpretation, programs, facilities, policies, and practices? Embracing a human-centered mindset in museums asks us to do just that, advancing empathy, human potential, and collective well-being as integral elements to our institution’s values and culture. And this is not just putting visitors at the center of our thinking, but all of the people that make up a museum’s community—visitors, staff, volunteers, members, donors, and community partners as well as neighbors and residents of our localities and regions. All of these individuals are part of a museum’s interconnected human ecosystem. Embracing a mindset of openness, participation, and social connectivity allows museums the chance to extend the boundaries of what is possible, and serve as sites for profound human connection in the 21st century. In their 2011 book Humanize: How People-Centric Organizations Succeed in a Social World, Jamie Notter and Maddie Grant discuss their ideas for developing a more human organization in a world affected by social media and the Internet. “We need organizations that are more human. We need to re-create our organizations so that the power and energy of being human in our work life can be leveraged. This has the power not only to transform our individual experiences in the work world, but also to access untapped potential in our organizations” (p. 4). This concept of a social museum relies on each and every stakeholder working together toward change, value, and impact (which is why using the stock image above actually makes sense to use in representing museums). The key elements of a social organization—embracing networks of people, considering social relationships inside and outside the organization, and enhancing collaboration in a way that crosses traditional boundaries—are all core to developing a human-centered mindset in museums. So how can those of us working in museums begin to make this shift happen toward a more human-centered mindset? In order to become social organizations that achieve positive impact in their communities, museums need to be rethinking their internal organization structures. Most museums rely on deeply ingrained, top-down structures that rely on territorial thinking, defined protocols, and traditional reporting structures based on academic degrees, power, silos, division, and oppression. In these traditional hierarchies, communication flows from the top to the bottom which means that “innovation stagnates, engagement suffers, and collaboration is virtually non-existent” (Jacob Morgan, “The 5 Types of Organizational Structures: Part 1, The Hierarchy,” Forbes, July 6, 2015). Furthermore, as stated in the nationwide report Ready to Lead: Next Generation of Leaders Speak Out (2008), organizations that maintain traditional hierarchies “risk perpetuating power structures that alienate emerging leadership talent in their organizations” (p. 25). The sluggish bureaucracy of this embedded management structure prevents a museum from being responsive to its staff and its broader community. In other words, traditional top-down museums are just not very human-centered. They tend to be leader-centered or focused on a few powerful individuals at the top. So how can this be changed? What steps can museum professionals take to think about and enact alternative structures? To be more people-centered, museum leaders and staff can work toward more participatory, democratic, and flatter models for organizational structure. In their recent book Creating the Visitor-Centered Museum (2017), Peter Samis and Mimi Michaelson discuss this transformation taking place in museums taking a more visitor-centered approach: “new ways of working ultimately shift traditional structures and may end up equalizing roles or flattening hierarchies” (p. 6). Efforts to decentralize decision-making and promote broader collaboration lead to museums that are more innovative, more responsive to change, and more likely to have a shared central purpose across its staff, volunteers, visitors, and community stakeholders—its human ecosystem. When we rethink and replace the outdated hierarchies, there is clearly a greater potential for a broader base of individuals to feel personal ownership over the meaningful work of museums in their communities. Aside from reinventing your entire museum’s organizational structure (which is awesome, but quite challenging and rare), there are smaller action steps that anyone can take within their own institution. One way to make these types of changes happen is to work toward flattening communication and expanding participation in decision-making. Seek ideas and input from staff and colleagues on a regular basis, and you don’t have to be a manager to do this. For example, instead of using meetings to passively report out information about upcoming projects or policies, use these times to also discuss critical issues and gather input. Even a large staff meeting can be a platform for two-way communication. In addition, empower staff at all levels to participate in setting goals for their departments and for the museum. This can happen at any level of an organization, and sometimes making changes at the smaller ‘grass roots’ level of an organization can eventually lead to significant changes at the top. And involving more staff input in goal setting may take a greater investment in time across an organization, it will lead to broader feelings of ownership once those goals are being implemented and achieved on the floor with visitors. Involving staff at all levels of an organization in goal-setting and decision-making can also work toward cultivating leadership at all levels. Human-centered museums are institutions that recognize leaders across all levels and departments, not just at the top. Finally, one important strategy for embracing a human-centered mindset in museums involves replacing outdated “org charts” with new ways of visualizing connections. Everyone reading this is probably familiar with the org charts that have each position in a box, and lines connect everyone based on management and reporting. Who manages who? Who evaluates who? Who has power over who? These charts fan out from the Director or CEO box at the top, ending at the bottom with lots of little boxes filled with part-time staff, security guards, volunteer docents, etc. Not only are these charts confusing (and oftentimes quite ugly), but they emphasize oppressive power relationships and do not accurately represent the way a museum works and how staff interact with each other. Not only is this a great way to visualize and map your existing connections with others, but you can also use this as a way to identify individuals or departments in your organization that you are currently not connected with. What are some ways you might begin to develop new connections to those people? What impact might building new connections have on your work, their work, and the museum’s work in the broader community? Are you working toward rethinking hierarchies and outdated structures in your organization? Add your voice to the comments below or via social media (@murawski27), and share your experiences or questions as part of this effort to make change happen in museums. Check out additional posts in this series about how museums might become more human-centered institutions working toward positive impact in our communities, including reflecting on personal agency as well as embracing a culture of empathy. I am so proud and excited that my home institution, the Portland Art Museum, will be hosting this fall’s MuseumNext conference. I have been fortunate enough to attend MuseumNext both times that it has held conferences here in the United States thus far: first in Indianapolis, and mostly recently in New York. This conference, perhaps more than any other, brings together a diversity of thinkers and leaders in the field of museums, attracting speakers and attendees from all around the globe. And with this fall’s theme of REVOLUTION, there is no doubt in my mind that it will be a powerful, transformative event that brings together risk-takers and changemakers from museums as well as the arts & culture sector. I am thoroughly excited to showcase the great work happening right here at the Portland Art Museum, and welcome attendees to gain a richer understanding of the innovative, diverse, and creative things happening here in the incredible city of Portland (far beyond the stereotypes of Portlandia). Hope to see many of you here this fall! MuseumNext is a global conference on the future of museums. Since 2009 it has acted as a platform for showcasing best practice today to shine a light on the museum of tomorrow. On October 2-4, 2017, we will be holding our third annual conference in the United States – with three days of presentations, discussion,s and debates at Portland Art Museum. Every MuseumNext conference has a theme, around which the community comes together to discuss the future of museums. This year the theme for MuseumNext USA will be Revolution. Museums aren’t strangers to revolution, we are constantly responding to and transformed by our changing society, whether that’s due to politics, environment or technology. Our institutions don’t stand still. At the same time, having the mandate to conserve, revolutions are a risk and challenge to many museums. We are now inviting proposals from our community on the theme of revolution, looking at what that means to individuals and institutions around the world. Taking a stand – How are museums acting as agents of change within their communities and fighting for social good? Managing change – How are museums responding to a rapidly changing society or change within their organizations? Mini Revolutions – What trends are revolutionising the field of museums, from the maker movement to being safe places for refugees? Collecting Revolutions – Museums collect and tell stories through their collections, but many of today’s most important stories center around civil movements, hashtags and other, uncollectable ideas. How do we document the revolutionary now? Or – We welcome your own ideas about how revolution relates to museums. MuseumNext follows a fast-paced format of twenty-minute presentations with the focus very much on practice rather than theory (please note that this is the only format we’ll use at this event and we aren’t seeking longer presentations or workshops at this time). Proposals for presentations should contain a title, names of presenters, a summary of the themes to be addressed, relevant links as well as a description of the expected learning outcomes. We offer those speaking at the conference one free ticket per session, and speakers are responsible for their own travel and accommodation. All proposals should be submitted via this form. As someone whose interests, skills, and even job title (Manager of Digital Learning) sit squarely between two areas of museum work—education and technology—I think pretty much nonstop about the relationship between the two. 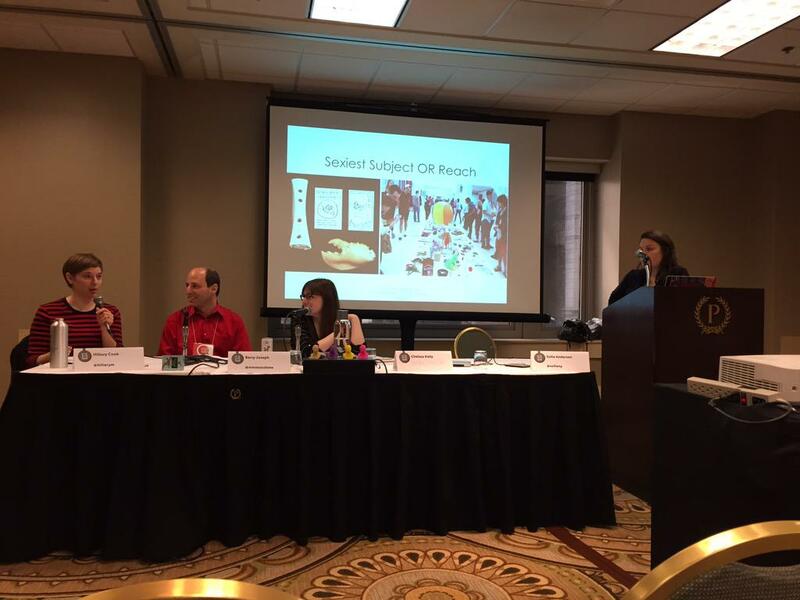 This year, I had the great fortune to be able to attend the 2015 Museums and the Web conference (MW or #MW2015) in Chicago, IL, and think out loud with hundreds of leaders, practitioners, and students passionate about museum technology. I am active in the Museum Education Division of the National Art Education Association (NAEA) and usually attend the NAEA convention, but this year I was excited to step away from my home base of museum education and into the world of digital. I was not disappointed: I found my tech nerd people (you should have heard the nostalgic sigh when someone showed a GIF of old-school Hyperlapse in action). However, this is not a post about digital nerdery, so if you understood not a word of that previous sentence, don’t be scared. From here on out, this is my attempt to bridge the areas of digital and education in museums. 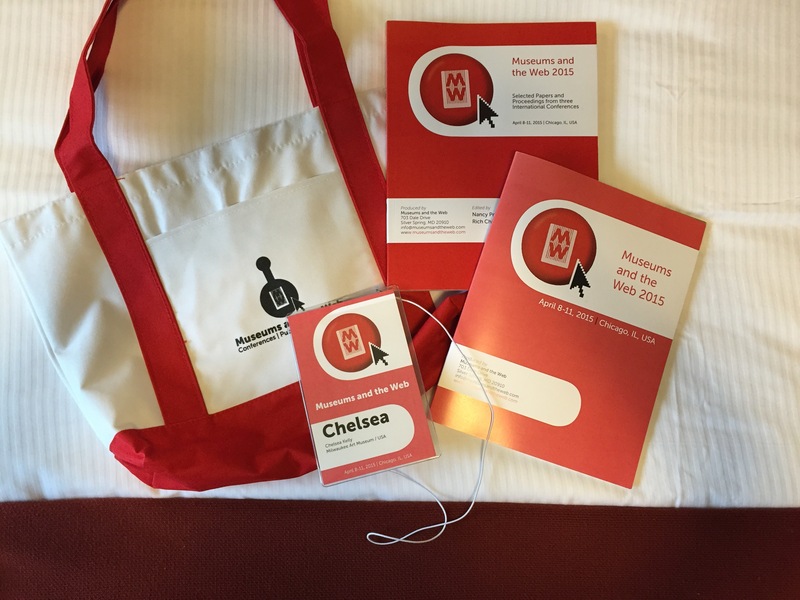 Here are some of my key takeaways from the MW2015 Conference. Museums and the Web does conference swag right. Check out those tote bags. Photo by the author. One of the best things I ever did for my career was sign up for Twitter, and I highly recommend it to anyone who wants to become more involved in the field. It has helped me make deep and vast connections with colleagues I never would have encountered otherwise, from all over the museum field and into art history, academia, and K-12 learning. I now use Twitter as my primary source for museum, art, and tech news; as a place to share resources; to talk about issues in the field; and to store my thoughts during conferences. At MW2015, I was finally able to meet many of my “Twitter colleagues” in person. As someone who’s more introverted, it made approaching someone I’d never met before much easier when I could lead with “I’ve followed you on Twitter forever!” and pick up a conversation where we left off online. I could see the same being true for a student or emerging professional. Museum technologists publish. This topic has been bubbling up both at this year’s NAEA (read Dana Carlisle Kletchka’s speech here) and among the museum educators present at MW2015. At Museums and the Web, presenters can host professional forums and workshops, but they can also present papers. For paper presentations, you write and submit a formal paper that goes beyond “show and tell” of a project and focuses on theory and practice. At the conference, you’re bundled into a session with two other author-practitioners who wrote on similar topics, and the three of you share key points. These engaging talks give technologists the opportunity to formally publish in their field, a boon for their institution and impressive internally to senior staff. Wrapping publishing into a conference also opens doors for emerging professionals and students to participate in the organization more deeply. But more than that, it legitimizes museum technology. Emily Lytle-Painter used that turn of phrase when I mentioned how impressed I was with the publishing arm of the conference, and it was an “a-ha!” moment for me. Publishing in this quantity and with such dedication—plus offering the papers online, for free, for anyone to read—helps the museum field at large see how important tech is, because it connects theory with practice. Michelle Grohe (Isabella Stewart Gardner Museum) and I are thinking about how to adapt this to the field of museum education, and I am hoping to have some ideas to pilot this summer. So stay tuned, and please feel free to get in touch with me if you’re interested in this topic. One of my coworkers told me about a moment in the Linked Open Data session where the speakers were asked to do an “elevator pitch,” as if to their director or board, about the benefits of linked open data. Afterward, the audience was asked to raise their hand if they were convinced. Just one person did–in a room of nearly a hundred. When my coworker—one of our fantastic IT (information technology) staff—told me this anecdote, we had a great discussion about the topic of translating what we do for non-technical staff. One of my biggest pet peeves about the museum field as a whole is that we use specialized language that visitors don’t understand. On top of that, we often use our own content-area words that our colleagues might not understand—curators use art history terminology, educators use teacher-speak, and digital has a host of terms drawn from tech. It’s so easy to forget that others might not know our vocabulary, and few of us are brave enough to ask our peers what the heck a mandala, parking lot, or API is. Educators are great at knowing our audience on tours; let’s apply that to our own institutions by explaining what we mean when talking to our colleagues, as well as not being afraid to ask coworkers to define their terms. Another tool is metaphor, which Tracey Berg-Fulton suggested at the conference—she “translates” by using art history examples to explain tech to curators, and puts curator needs into tech speak for IT. When we translate what we mean, we gain powerful allies and advocates. We grapple with the same issues—so let’s collaborate more! There were countless themes and issues that surfaced during Museums and the Web. Technologists such as Peter Samis (SFMOMA) are thinking about storytelling in the digital sphere. We’re grappling with focusing on process vs. the object, as evidenced by a talk on museum makerspaces by Desi Gonzalez, which in turn sparked a sideline Twitter debate about visitor motivation. Developing projects that aligned with institutional mission came up again and again—as a guidepost, as a tool for advocacy, as a way to develop buy-in from colleagues. And we’re struggling with how to define impact and evaluate digital projects—how do we avoid “anecdata” (anecdotal non-data) and really dig deep into showing change? I’m sure that more than one of these topics resonated with you as a museum educator–so it’s no surprise that I think we should collaborate more internally, cross-departmentally. The museum technologists leading the deepest organizational change and the most impactful projects are those who have strong collaborations cross-departmentally. So if you’re not already, reach across the aisle of your museum and foster relationships with your tech folks–then we can innovate together rather than separately! It doesn’t have to be a huge, scary endeavor: start small. Have coffee with one of your museum’s digital/IT staff to learn a bit more about his or her job, and let them know what you do. Don’t be afraid to ask questions—your genuine curiosity will go a long way. Find existing projects that you might be able to support, and share what you’re working on. See if there’s a cross-departmental meeting like a Technology Team you could join, or invite your new IT pal to join in an education meeting. Finally, one of the biggest threads of the conference was about how change is affecting our institutions (you can track lots of different conversations at #MWChange). You’ll notice that “digital” wasn’t in that sentence, but it seems to me that organizational change is, at many institutions, being spearheaded by digital staff. I think this is because digital projects are often catalysts that force museum staff to rethink business as usual. Keir Winesmith (SFMOMA), Michael Parry (Powerhouse Museum, Sydney), Dafydd James (National Museum Wales, UK), Seb Chan, and Aaron Cope (both from Cooper-Hewitt) all led sessions that focused on or touched on institutional change as a result of digital projects. I highly recommend checking out Keir, Michael, and Dafydd’s excellent slides. Their stories all rang true with one of my favorite books on change and leadership, Leading Change by John Kotter. Kotter proposes eight stages of organizational change, and asserts that it’s a long-term process that requires deep buy-in from all areas and levels. His theory resonates deeply with the change strategies put forth at MW2015. Both Kotter’s book and the papers written by these presenters (here and here) are well worth a read for those of us thinking about deep change in our institution and in the field at large. I’m sure you’ll find that there’s lots of overlap between our work as museum educators and the work of our colleagues in technology. After a week with some wonderful museum technologists at Museums and the Web, I guarantee that there is a lot we can learn from each other to invigorate our practice and better serve our visitors. PS: I also had the pleasure of presenting at the conference with educators Hillary Cook (Art Institute of Chicago) and Barry Joseph (American Museum of Natural History), organized by Sofie Anderson (Antenna Labs)! We talked about digital in teen programs, and you can read more about our session on Barry’s blog. Featured header image: A shot of the closing reception at the beautiful (and massive) Museum of Science and Industry in Chicago. Photo by the author.